I rely on my iPod for a variety of science-on-the-go purposes, most notably Podcasts. Podcasts are an excellent way to occupy your downtime when waiting in line, walking along, at the gym, or even driving (if you don’t use earphones). There is a plethora of science podcasts available through iTunes – Scientific American, Nature magazine, Science magazine, the Naked Scientists, NPR’s Science Friday, and many more. 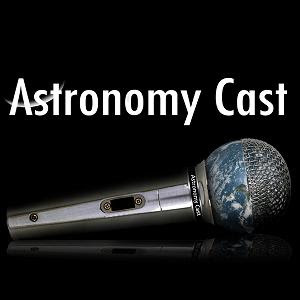 My favorite Podcast, however, is available from a small, grass-roots organization called Astronomy Cast. I enjoy this particular podcast because its focus is astronomy, physics, astrophysics, and cosmology – my very favorite subjects! The format of the show is simple. It features the host Fraser Cain interviewing astronomy professor Dr. Pamela Gay about a variety of science related topics. The chemistry between the two is what makes the show work so well. Both show unbridled enthusiasm for their topics and they’ve developed a very successful formula in communicating complex scientific subjects to the masses. One aspect of Astronomy Cast that I particularly appreciate is that the segments are short, typically 5-15 minutes in length. This way I can hear a variety of subjects during a regular lunchtime. I usually keep a whole catalog of Astronomy Cast podcasts on my iPod so I can listen to my favorites over and over again. Astronomy Cast offers a wonderful blend of topics. In the past few months, a sampling of subjects includes, ultraviolet astronomy, quantum mechanics, black holes, exoplanets, interferometry, and so many others. I also like the regular “Question and Answer” shows where listeners submit questions, and each one is given special consideration with a detailed, well thought out response. I couldn’t recommend this podcast more highly. If you haven’t already done so, all you Science Lifestylers should climb aboard the science podcast bandwagon. It is a great way to fill in those interludes during the day when you could be doing something useful like learning about developments in science. I just checked out astrocast and it is great, thanks alot!! HELLO, I listend to the podcast on quasars today and the 1/2 hr. show was so good. I learned alot about th subject.